Representative Honours: Northern Ireland: 17 Full Caps/2 Goals (1995-1997), 3 ‘B’ Caps (1994-1998), 1 Under-21 Cap (1994), 2 Under-18 Schools. Club Honours: (with Glenavon) Irish Cup Winner 1991/92; Mid-Ulster Cup Winner 1991/92, 2004/05; Irish League Division One Runner-Up 2004/05 (promoted via Play-Off). 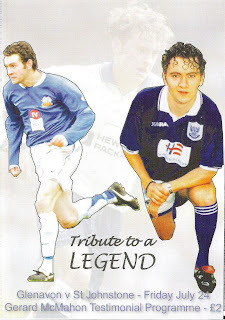 Gerard McMahon came to prominence with Glenavon in the early nineties with his explosive change of pace and accurate finish which earned him a dream move from Mourneview Park to White Hart Lane in 1992. McMahon had started with Glenavon as a 14 year old, helping the Lurgan club to the Youth League Championship in 1991/92. 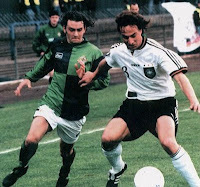 He had only broken into the Glenavon first team in the second half of the 1991/92 season, making his Irish League debut against Newry in February 1992, and established himself in the side for the rest of the season. It was his performance in the 4-0 Bass Irish Cup sixth round replay win against Glentoran that saw scouts from some of England’s biggest clubs inquiring about him, and by the middle of March a transfer had been agreed with Tottenham Hotspur. With the transfer business out of the way, McMahon was free to concentrate on Glenavon’s bid for the Irish Cup. Despite being without Glenn Ferguson and Stephen McBride through injury, Glenavon comfortably cruised to the final and, in a fairytale game, McMahon scored the free-kick which defeated Linfield 2-1. When Gerard moved to London for £100,000 in the summer of 1992 it took him quite a while to settle, with the departure of Terry Venables, and the arrival of Ossie Ardiles. However, he persevered and was eventually rewarded when his long-awaited first-team chance came at the end of the 1994-95 season. 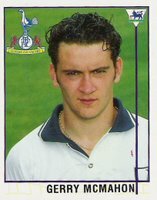 McMahon’s Spurs debut came in May 1995, and he was a regular in the first-team squad throughout the following season, without really establishing himself in the starting eleven. In May 1995 he won the first of his seventeen caps when he played for Northern Ireland against Canada in Edmonton. McMahon found his first-team opportunities at White Hart Lane limited and so, in September 1996, he stepped down a division in order to further his career. The Stoke manager, Lou Macari paid £450,000 for his signature, and made McMahon a regular in the starting eleven, but with Brian Little replacing Macari in the summer of 1997 it seemed that McMahon didn’t belong in Stoke’s first-team plans either. In February 1998 St Johnstone signed McMahon from Stoke for £85,000. 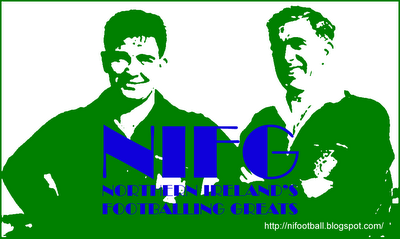 At McDiarmid Park he linked up with fellow Northern Ireland players Danny Griffin and George O’Boyle. Again however McMahon found himself out of the first-team following a change of manager, with Paul Sturrock leaving St Johnstone in 1999, and in the summer of 2000, when his contract expired, McMahon was allowed to leave. 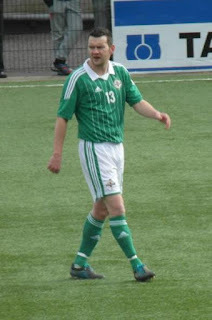 After trials with Notts County and Macclesfield, McMahon returned to Glenavon in August 2000, initially on a short term contract, but after a month Colin Malone convinced him to sign a permanent deal. It proved a productive move as the Lurgan Blues finished as Irish League runners-up. McMahon, always honest about his ambitions to move back across the water and regain his international place, was appointed club captain for the 2001/02 season. A leg break picked up in December 2002 ruled him out of football for a year-and-a-half. In his absence, Glenavon really struggled, and despite his appointment as assistant-manager, they were relegated to the Irish League Intermediate Division One at the end of the 2003/04 season. McMahon returned to fitness, helping Glenavon regain their Premier League position as play-off winners in 2005, and subsequently consolidate their top-flight position the following seasons. 2008/09 was McMahon's testimonial season and marked his final campaign as a Glenavon player. On his retirement he was widely lauded as among the finest Irish League players of his generation. 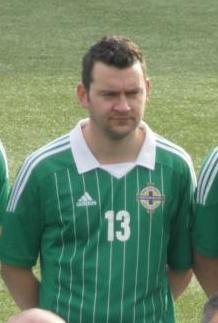 He remained at Mourneview as reserve team manager until October 2012 when he became assistant manager at Loughgall. With Loughgall he made a return to the playing field. He left Lakeview following a managerial shake-up mid-way through the 2013/14 season. He then had a spell in charge of Dromara Village before being appointed manager at Lurgan Celtic in May 2018. Summary: 6(11)/2. Won 3, Drew 5, Lost 9. Summary: 1(2)/0. Won 1, Drew 0, Lost 2.